The fourth edition of The Atlantic Cup presented by 11th Hour Racing continued its tradition of extremely close racing, concluding fittingly with first place overall determined by a tiebreaker. Spanning three weeks in May, The Atlantic Cup has become a staple on the offshore race calendar as the longest offshore race on the East Coast and the only dedicated Class40 race in the United States. Gryphon Solo 2 co-skippers Joe Harris (standing) and Patrick O’Connor won The Atlantic Cup presented by 11th Hour Racing in a tiebreaker. The five teams set to compete in the 2014 race included American entries #39 Pleiad Racing, #54 Dragon, #106 Gryphon Solo 2 and #116 JeffreyMacFarlane.com, and Canadian entry #25 Flatline. Just two days prior to the start, Flatline had to pull out of the first leg due to setbacks that prevented the team from getting to Charleston, SC in time for the start. The first leg of The Atlantic Cup started just off the Charleston Maritime Center at 12:05 pm Saturday, May 10 under double-reefed mains in 20-25 knots of breeze. The tight racing theme began as the doublehanded teams left the harbor, with Dragon, Pleiad and Gryphon Solo 2 in sight of each other for the first two days of the 642-nautical mile Offshore Leg to New York, NY with multiple lead changes. 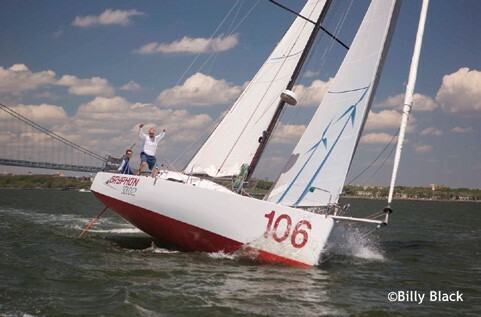 Gryphon Solo 2, skippered by Joe Harris (South Hamilton, MA) and Patrick O’Connor (Buffalo, NY), crossed the finish line in New York City first at 5:20:10 ET Wednesday, May 14, with an elapsed time of 89 hours, 15 minutes and 10 seconds. After a painful push into New York Harbor and multiple tries to finish in little to no breeze, Gryphon Solo 2, Dragon and Pleiad finished within 23 minutes of one another. After a brief stopover in New York where teams took part in The Atlantic Cup’s education program designed to introduce students to the sport of offshore racing and highlight the environmental initiatives that make the event the leading sustainable race in the U.S. Further promoting the sustainability of the race, The Atlantic Cup and presenting sponsor 11th Hour Racing hosted Living on the Edge 2.0, showcasing new on-water technological innovation. Wendy Schmidt of the Schmidt Family Foundation kicked off the evening, held on board Hornblower Cruises and Events’ Hornblower Hybrid vessel at Pier 25. Speakers included Richard Jenkins, Founder of Saildrone and the holder of the world land speed record for a wind-powered vehicle; Ryan Williams, Sustainability Director for Method; Cameron Clark, General Manager and engineer for Hornblower’s hybrid technology; and Chip Giller, Founder of Grist.org. The 231-nautical mile doublehanded Sprint Leg took teams south out of New York City to a turning mark off Barnegat on the New Jersey coast before turning north and heading to Newport, RI. Kicking off at 12:05 pm Saturday, May 17 with a large spectator fleet lining the seawall in Battery Park City, the tight racing theme continued with a duel between Dragon and JeffreyMacFarlane.com, who never lost sight of one another throughout the leg. 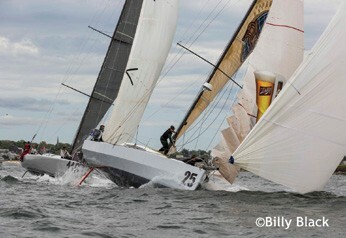 Coming into Narragansett Bay was incredibly tense, with both teams crossing each other in match racing mode. Ultimately, JeffreyMacFarlane.com was able to squeak ahead and cross the Jamestown FiSH Finish Line with an elapsed time of 29 hours, 51 minutes, 7 seconds on day, May 18, edging Dragon by 1 minute, 20 seconds. A better performance in the Offshore Leg might have clinched an Atlantic Cup victory for JeffreyMacFarlane.com co-skippers Jeff MacFarlane and Jake Arcand in their first attempt. After two legs, just two points separated Gryphon Solo 2, Dragon and JeffreyMacFarlane.com. In the week leading up to the Inshore Series, Atlantic Cup teams were based at Newport Shipyard alongside the IMOCA 60 fleet as they prepared for their NY-BCN Trans-Atlantic Race. Additionally, teams celebrated with a standing-room-only audience at Newport’s Casino Theater for Shipyard Shorts, a collection of documentary films put together by newportFILM. Newport finish line sponsor Jamestown FiSH hosted the teams on their patio Friday to kick off the Inshore Series on Memorial Day weekend. Dragon, skippered by Mike Hennessy (Mystic, CT), determined to dominate the fully crewed Inshore Series on Narragansett Bay, started strong in the first race, putting 200 yards on the fleet on the run to the Beavertail turning mark, but then disaster struck. Moving at 12 knots, Dragon grounded on a rocky outcrop just before the mark, bringing the boat to a complete stop and leaving bowman Emma Creighton hanging from the sprit. The crew got Emma safely back aboard and the spinnaker down, but the collision forced Dragon out of the remainder of the Inshore Series. “We went out yesterday and practiced our timed starts and felt really good about our boathandling skills,” said Dragon co-skipper Rob Windsor (Centerport, NY). “We were about 15 boatlengths ahead and the boat was super-fast, but we were about 15 feet inside of where we should have been. We were getting ready to take the kite down and Emma went out on the end of the sprit to get the lazy spinnaker sheet so we could douse. As she went out, we hit a rock.” Pleiad Racing, six points behind Gryphon Solo 2 and Dragon at the beginning of the Inshore Series, took advantage of Dragon’s misfortune and dominated the series by winning three of the five races, en route to securing third place overall. The Inshore Series was hotly contested, as illustrated by Flatline and JeffreyMacFarlane.com. At the end of racing on Sunday, May 25, Gryphon Solo 2 and JeffreyMacFarlane.com were tied. According to The Atlantic Cup’s Notice of Race, all ties are broken in favor of the team with the most points earned between the first two legs. This left Gryphon Solo 2, who bested the field during the Offshore Leg and placed third in the Sprint Leg, as 2014 Atlantic Cup presented by 11th Hour Racing Champions. 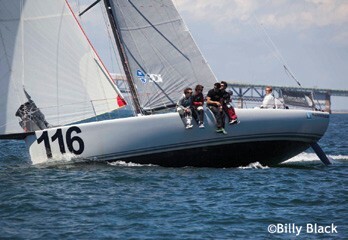 Gryphon Solo 2 claimed $4,000 of the $15,000 purse, one of the largest in sailing in the United States. 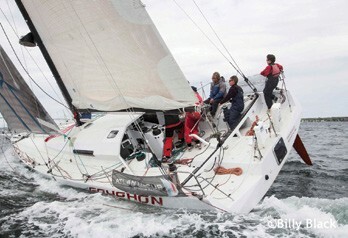 Gryphon Solo 2 shows her winning ways.